The month of May is often an exciting time for college graduates as they enter the “real-world,” and put their coursework to the real test of landing a great job worthy of their hard work, sweat and perhaps tears. Throughout my collegiate teaching career students have asked me, “Professor Simpson, how do I land a great job after graduation?” There’s no secret recipe or definite answer to that question, but there are strategic techniques that will inevitably contribute to successfully landing a great first job, which in returns sets the tone for your entire career. I graduated with my bachelors at the age of 20, my masters by 22, and I am happy to share the following tactics that have been useful for me throughout my professional trajectory. 1. Be A Student of The Game! Read, read, and then read some more! You must continuously learn about the industry you are striving to be in. Those who excel in any field are stewards and students of the “game.” And we all know, you must be in the game to win. You should never ever stop learning. Education is constant and includes continuous study of new technology, industry advancements, major players in the game who are thriving, and commerce news. Every business has its own norms, for me working in media, sports, entertainment and even academia, I must be abreast of pop culture, digital and social advancements, platform and software changes and so on. As as professor, my foremost job is to make sure that my students are learning everything that’s presented in the syllabus, but I also encourage my students to teach me new things. Even as an expert in my field, my students teach me beneficial strategies that help me to execute my corporate and consulting roles on a greater scale. Years ago, I remember a student asking me, “Professor Simpson, are you on Snapchat? If not, can I teach you?” I now currently lead social and digital strategy for all of my clients and am grateful for everything that my students continue to teach me. Students of the game are knowledgeable of pay rates including standard salaries based on title, duties, company size as well as the location of the position. What I learned early in my career is that no one will ask or fight for you more than yourself. We get what we go after and what we ask for, but in order to do so, we must know our value including undeniable unique attributes to help score more points (money). 2. Make Sure That Your Resume Sells What You Can Do. While in college, I participated in anything and everything that I thought could remotely advance my career or even just look good on my resume. My resume consisted of traditional work experience, as well as college leadership volunteer work and relevant coursework to display that I knew how to execute day-to-day tasks that my entry level role required. I see so many resumes on a daily basis that have excellent GPAs, from fantastic universities, however, they do not showcase that the graduate knows how to do anything listed in the job description. The entire purpose of college coursework is to prepare you for your dream role, so convey that you know how to get the job done by highlighting pertinent and applicable projects and assignments, as well as internship work. 3. Work for free: Volunteer. There are perks in doing free work — people will see how good you’re, how smart you’re and what you bring to the table, which can lead to a paid gig. Back in the day when I was an intern, we did not get paid, in fact we paid thousands of dollars for three credits to even take the internship, but the benefit was that internships afforded the opportunity to prove yourself and hopefully receive a job offer after graduation as I did. Offering up your services whether you have a job or not displays that you can do the work required by a full-time position. If you do have a full-time role and you volunteer by taking on additional work, it’ll show your leadership skills. Every promotion I’ve ever received was because I volunteered above and beyond my obligated duties taking on additional work outside of my regular scope. This gave me reasons to ask for more compensation or a better title. Not everything is about financial gain right away, but on the contrary, after you have worked hard, proved yourself and put time in, you deserve to get paid. 4. Be A Content Creator and Never Stop Branding Yourself. If I am hiring a social media intern, I want to see their social media accounts, evaluate their tone, get a sense of their voice and message delivery. If it is not evident to me that the applicant is well-versed in that space, there’s no reason why I would hire them, or if I search for their social media and it is not a proper reputation of what I want my brand or company to be aligned with, there is no way that I will move forward with their candidacy. Continuously build your personal brand by creating a go-to place where anyone can see your work and learn your worth. Nowadays people want to hire content creators so, when someone searches you, what do they find? People should be able to find your personal talents and interests online. You do this by creating content on subjects that interest you and are valid to your industry. This can be your personal website or social media pages on LinkedIn or Twitter, a written or verbal blog about the business that you want to work in, your personal thoughts on commerce updates or relevant topics. LinkedIn is definitely the ultimate career social media aid, but it is best used with engagement. Additionally, there are always new engaging platforms to check out like Jopwell or something that’s specific to your industry. When people search for you, which they definitely will, they are able to get a vision of your voice on your industry. Moreover, your online presence should be consistent to your desired corporate stance. One thing I cannot stress enough is paying attention to detail — every last detail. What you present online is an absolute reflection of yourself, it is a brand imprint. 5. Mentors and Alumni are your BFF. Check-in often with mentors and those of influence who’re in your network to showcase your advancements and new work (branding). Your college Career Services department is a significant place to network. While I was in college, I obtained a list of all alumni that worked in sports, entertainment and media and I made sure that they all knew who I was and that I wanted to enter their industries. I contacted them via email or hand-written notes with short concise language asking to treat them to coffee or for a 10-minute phone conversation. Most of the alumni that I contacted were very successful, many c-suite and probably didn’t have too much time on their hands, but keep in mind that a request of 10 minutes isn’t too much to ask if a person has an affinity to you. Almost all responded sooner than later (with the help of a reminder email if needed) and gave me 10 minutes. When we finally met in-person or on the phone, I had questions ready about their specific career trajectory which I found from researching them. All people love to talk about themselves, so give them an opportunity to do so by showing real interest in each individual. Mentorship should be organic. I wouldn’t suggest ever asking someone to be your mentor, because they need to know and understand who you are and what you bring to the table first. Do we ask people to be our friends? We usually do not, as that is an organic relationship that is quite fruitful like mentorships. I am still in contact today on a regular basis with my mentors whom I met while in college and after graduation more than ten years ago. I make sure to check-in and see how they’re, share great news about me, industry research, necessary catch-ups and offer them my services or assistance if needed. 6. Pitch Yourself, Request Informational Interviews and Commit Yourself to Build Beneficial relationships. Be social, go out, meet people introduce yourself, let people know what you do or aspire to do and point them to your content. Never be afraid to let the desires of your heart be known, it’s actually imperative for growth and longevity. I do not know too many people who landed a great gig because they simply applied online, which tells us that it’s about who you know and who is in your network. I learned early on to send mentors updates on cool projects, business articles that I thought they would enjoy, and to share notes on anything that I read about their company and thought was awesome and wanted to congratulate them on. That way I’m top of mind if a job comes across their desk that they know I may be qualified for. Don’t let people forget about you, but also don’t be stalkerish. Without mutually beneficial relationships networking is pointless. Ask yourself, what can you offer a person and is it clear to them? You want to always be cognizant of someone’s valuable time and energy spent with you. Be able to convey in any relationship what you bring to the table and how you enhance their life or else it is pointless. Strive to build a community that looks to you for your voice so that you can your share ideas and learn from them as well. In college and early on in my career, I ended informational interviews, (which should be a constant on your calendar,) asking if there’s anyone else that the alumni or mentor thought that I should meet or connect with. Hopefully in the small time-frame of our meeting I impressed them enough to open their network and introduce me to someone else of influence. 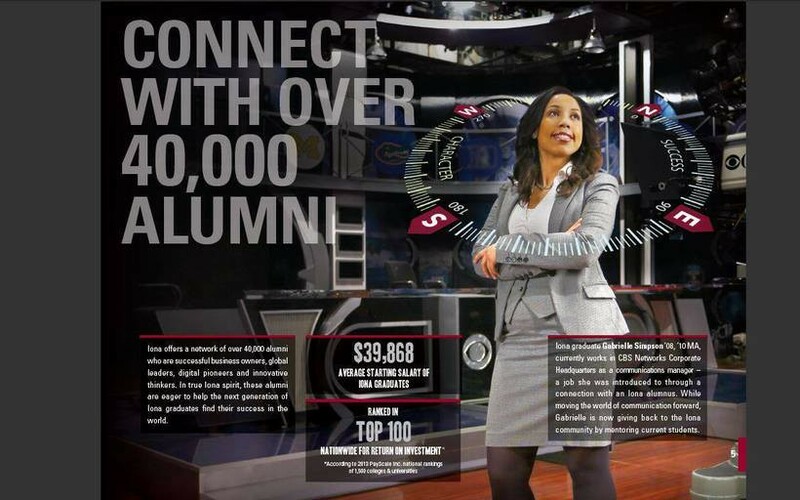 This domino effect significantly enlarged my network with Iona College alumni and also with industry leaders, which in all enabled me to land my first corporate gig at CBS Corporation at the age of 20. Today, when I catch up with my mentors, it’s top of mind for them to introduce me to someone in the industry that they think I should know. They want to build my network as much as I do and they want to introduce me to individuals who can advance my career without me even asking for assistance. Originally published at www.huffingtonpost.com on May 23, 2017.